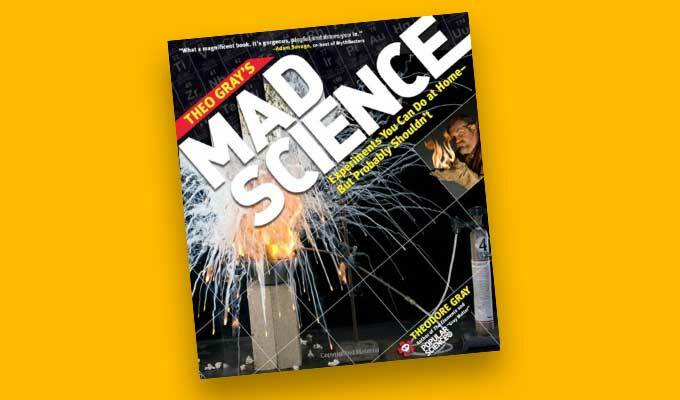 Theo Gray’s Mad Science ($17) is a rare home-chemistry book where the advice of “don’t try this at home” is, for once, appropriate. I usually complain about the scare mongering of home chemistry, but half of the experiments in this how-to book really are extremely dangerous. But the other half are pretty cool. There are no explicit step-by-step instructions given for any of the experiments, just guidelines of what to do. Gray, whose column appears in Popular Science, wants you to do some research and not just be a “script kiddie.” Stunning photos of what to expect from each project help. My son and I have done a few of these and they do work. The prime lesson engendered by this book is the sense that the material world is far more accessible to hacking than first appears. Real Danger Alert: This is the most dangerous experiment in this book. Sodium burns skin and eyes on contact and explodes when exposed to water in any form, sending flaming liquid metal in all directions at high velocity. Chlorine gas kills painfully and spreads rapidly. Under no circumstances should either of these chemicals be handled outside the presence of an experienced chemist. Combining them borders on lunacy. 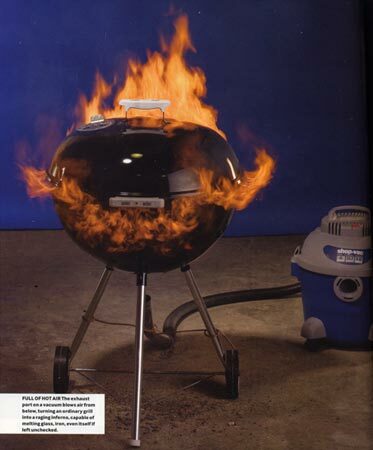 FULL OF HOT AIR The exhaust port on a vacuum blows air from below, turning an ordinary grill into a raging inferno, capable of melting glass, iron, even itself if left unchecked. All the components of glass can be found in two places: the beach and the laundry room. It's possible to melt pure-white silica beach sand into glass, but only at temperatures of 3,000 to 3,500°F. Washing soda, lime or borax (a traditional laundry aid) added to the sand disrupts the quartz-crystal structure of silica and reduces the required temperatures to a more practical, though still dangerous 2,000 °F, which I achieved with a backyard grill and a vacuum cleaner. A charcoal fire fed with air from the bottom is hot enough to melt the combination of those materials into glass but not hot enough to make it truly liquid, so bubbles tend to remain and make the glass cloudy. I mixed the finely ground ingredients together and heated them in a cast-iron pot, then poured the molten glass into a graphite mold and pressed it down with a graphite stamp. Soda-lime glass has the lowest melting point but must be cooled slowly to avoid shattering from the thermal stress. 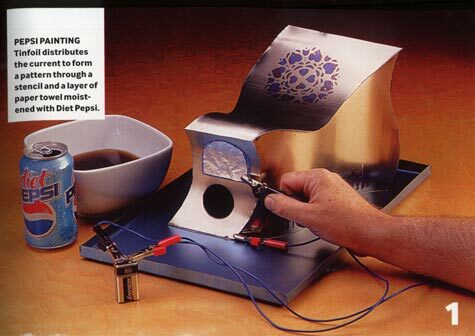 PEPSI PAINTING Tinfoil distributes the current to form a pattern through a stencil and a layer of paper towel moistened with Diet Pepsi. Homemade Titanium: With lots of heat, some flowerpots and common chemicals, you can turn raw ore into shiny metal. An iron crowbar costs about $8; one made of titanium, $80. Solid-titanium scissors start at $700, and don't even ask about the titanium socket wrench. Titanium must be a rare and precious substance, right? Actually, as raw ore, titanium is 100 times as abundant as copper. ... At temperatures high enough to melt it, titanium exposed to air catches fire. So it has to be refined, forged, welded, and cast in a vacuum or under inert gas--an expensive process. Yet I was able to make titanium using equipment I had lying around. I did it with thermite reduction, a process commonly used to weld train tracks. In an iron thermite reaction, iron oxide reacts with aluminum and comes out as liquid iron. I just swapped in titanium dioxide instead. But that reaction, in which titanium dioxide transfers its oxygen atoms to aluminum, doesn't release enough heat to melt the materials. So I mixed in drywall plaster (calcium sulfate) and more aluminum powder. They react to create huge amounts of extra heat, enough to melt the titanium and allow it to pool at the bottom of the container. Adding ground fluorite powder makes the molten metals more fluid and protects the titanium from air as it cools. I used clay flowerpots, as suggested by Gert Meyer, who developed this procedure. When nested with sand between them, they last just long enough to let the titanium cool into beads of solid metal. Many of the topics I write about are things I did when I was growing up, and I survived. Without those experiences I might have ended up as a stock broker, or worse. Science is not something practiced only in labs and universities. It's a way of looking at the world and seeing truth and beauty everywhere. It's something you can do whether you are employed as a professional scientist or not. While I have a degree in chemistry from a fine university, I've never worked as a professional chemist. I do these demonstrations in my shop on a rural farmstead half a mile from the nearest neighbor. (This is handy when exploring the louder aspects of chemistry.) Mostly I use simple kitchen and shop supplies and chemicals from the hardware store or garden center. I do avoid working in a real lab, because I would much rather tinker in my shop and find a simpler (some might say cruder) way of making the experiment work. Amateur scientists, many of them self-taught, tinkering in their shops and basements have done great things. Using a spirit of making do with what they have and seeing just how far they can take it, they make real contributions to the advancement of science. It makes me cringe when I see warnings to wear gloves and safety glasses while working with baking soda. It's called crying wolf, and it's deeply irresponsible, because it makes it that much harder to get through to people about real dangers. Every chemical, every procedure, every experiment has its own unique set of dangers, and over the years people have learned (the hard way) how to deal with them. In many cases the only way to do an experiment safely is to find a more experienced person to help. This is not book-learning, it's your life at stake and you want someone by your side who knows what they are doing. There is an unbroken chain of these people leading right back to the first guy who survived, and you want to be part of that chain. When I do an experiment that looks crazy I either have someone with me who's done it before, or it's something that I've worked my way up to slowly and carefully. I build in layers of safety, and I make sure that if all else fails I have a clear path to run like hell (and of course I wear glasses at all times).